Name: Nicolas, 18 year old male.JUVENILE ACNE recurred after discontinuing antibiotics because of severe headaches and mild depression. Baseline picture not available. First picture after 4 treatments. Second picture: 5 weeks after professional treatments and home care. 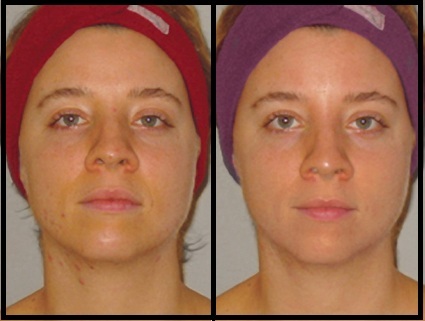 Acne clearance maintained with monthly treatments professionally. Name: Nancy, 36 year old female.ADULT ACNE with open & closed comedos, some pustules. Acne worsens during stress. Second picture: 5 weeks after professional treatments and home care.Client is acne free after 1 year with monthly maintenance except for some minor break out (1 or 2 pimples on chin) associated with her period. Name: Amy, 17 year old female. INFLAMMATORY PAPULES & PUSTULES appearing on the forehead, nose, cheeks and chin, was desperate to look good for her High School prom. Second Picture: 4 weeks after professional treatments and home care. Client commented that she is very happy and will try to keep up with monthly maintenance. Name: Josee B. 36 year old female. LOCALIZED MINOR ACNE, Mild Acne Scars. Client has tried Accutane oral Rx and discontinued because of the side effects (migraine, depression). .
Second Picture: 8 weeks after professional treatments and home care. 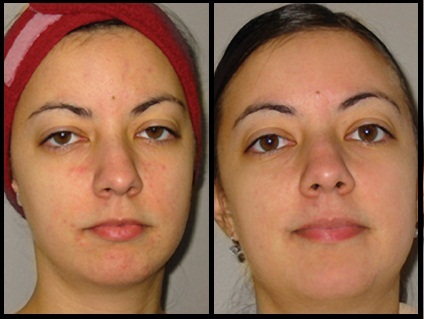 Acne scars improved 95%, acne completely under control. Client commented results are fantastic and most of all without any nasty side effects. Our in-depth consultation costs $60 and includes a treatment which usually works within 24 - 72 hours to give you an idea of the kind of results you can expect. It also allows us to determine which products and treatment protocols are best suited for YOU! 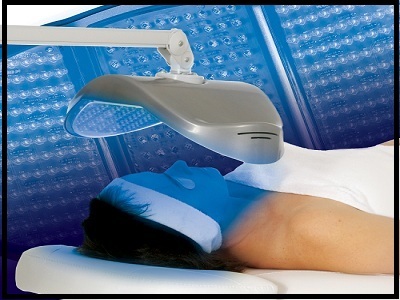 Subsequently, a series of six treatments ($300) perfomed weekly or monthly is required on average. If you are already using Alpha Hydroxy acids, Benzoyl Peroxide, Beta Hydroxy Acids, Sulphur, Vitamin A, Pharmaceutical Grade products and other ingredients that have a proven track record of controlling acne breakout, keeping blackheads under control, reducing the damage caused by years of infections and diminishing the scars that occur from picking and scrubbing the face, please bring these with you when you visit us for a consultation.